The Lap Top Easel. A Look Beyond Tablets. Lap desk or book stand. 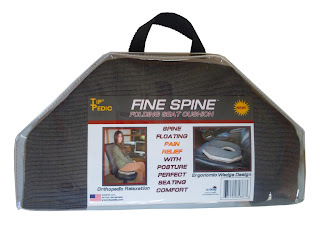 The Five Star Fine Spine Flex Cushion by Tip Pedic. Fine Spine Flex. The Back Pain Eliminator. Why my customers are raving over my patented seat cushion. Made in the U.S.A. The ergonomic design of the Fine Spine Flex Cushion folds in half for easy travel and the light weight carry case protects the quality Sunbrela brand fabric from dirty or wet surfaces while being used outdoors or at stadiums. The Doctor recommended Fine Spine Flex Cushion was originally designed for back pain relief and posture perfect long term seating comfort. Since its inception the Fine Spine Flex Cushion has become very popular with fitness trainers as a exercise cushion for enhanced crunches and a fast track to a six pack. The center cut out section protects your tail bone from touching the floor and the wedged shape design enhances the leverage of your sit up, producing twice the results in half the time. The Fine Spine Flex Cushion is designed by renowned custom cushion builder David Pulver, a second generation Upholster with a unsurpassed reputation for quality in the art. Experience the ultimate quality you deserve in orthopedic seating comfort and back pain relief that will last for years to come. The tip pedic brand product makes a great gift for all ages and abilities.